New data from Nielsen released this morning takes a look at the typical U.S. smartphone user, specifically their age and income, as well as the penetration of smartphones into various demographic groups. Data like this can help developers, publishers and advertisers better understand who owns a smartphone, but it can also help to determine if the devices are successfully penetrating the low-end income brackets thanks to lower price points. The answer to that latter question is yes: even those making less than $15,000 per year are likely to have a smartphone – but only if they’re young. Over half (56%) of this income bracket are smartphone owners, when aged 18-24. In the 25-34 age group, 43% of those at this income level are making room for a smartphone in their limited budgets. In the more pragmatic 35-44 age group, 31% of those making under $15,000 own a smartphone. While these mobile users don’t necessarily live below the poverty threshold (it’s unclear if they are single, married, supporting families, etc. ), they’re not far off. In 2011, a single person making $10,890 or less was living in poverty, for example. Just increase that by a few thousand annually, and all of a sudden, they’re smartphone owners. Within the older age groups, smartphone penetration decreases – but it decreases within higher income brackets too, for the most part. These numbers, quite frankly, are surprising. They indicate that smartphones, no matter the expense of the device itself or the accompanying data plan, are increasingly becoming a necessity, not a luxury. How else can you rationalize how someone who makes less than $15,000 affords one? They find a way. Maybe they don’t even own a computer? Or maybe in that 18-24 age group, mom and dad still help out. But ages 25-34? Those decisions to buy are their own, likely made while unattached from parents’ pursestrings. 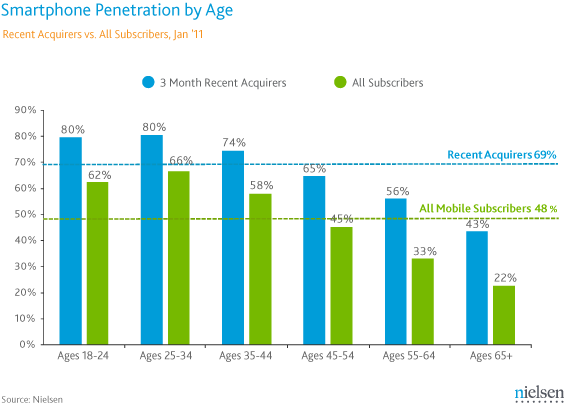 The trend is further reflected in Nielsen’s “smartphone penetration by age” chart, which shows that 80% of those in both the 18-24 and the 25-34 age groups who acquired a phone in the last 3 months chose a smartphone. Nielsen’s own analysis didn’t concentrate on this aspect of the data, instead focusing on the overall youth-owning-smartphones trend. Or the fact that when both age and income are taken into account, older subscribers with higher incomes are more likely to have a smartphone (i.e., those aged 55-64 making over 100K are as likely to own as those 35-44 making 35-75K). That’s important, too, especially as it relates to the low-income/younger demographic data. For the older generations, smartphones are a luxury. Those folks are more likely to buy if they have the money to do so. But for the youngest mobile owners, smartphones are a must. And they’re finding a way to afford them.